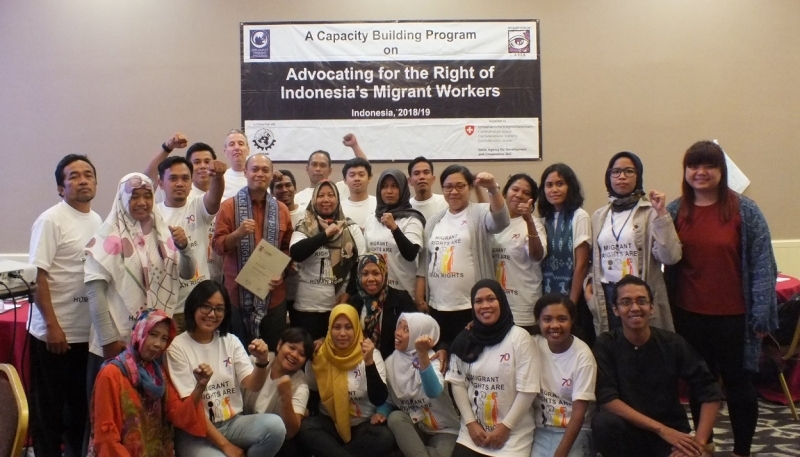 A special capacity building program focused on the rights of Indonesia’s migrant workers was launched in Jakarta on June 28th, with 27 participants drawn from across Indonesia. The program aims to support advocates working for the millions of Indonesians working in countries such as Malaysia, Hong Kong, Singapore and across the Middle-East. It is an initiative of MFA/SBMI and DTP and will include 5 x 4-day modules over the next 12 months. After welcomes from the program partners and a senior offical of the Indonesian government, the participants introduced themselves and their work – highlighting some of the issues of concern – including the number of deaths of migrant workers in Indonesia, discrimination against and treatment of migrant workers with HIV/AIDS and the treatment of Indonesian seafarers. Wahyu Susilo of Migrant Care provided an overview of current law, policy and practice relating to migrant workers, while Yuyun Wahyuningrum (DTP alumna) introduced participants to approaches on strategic advocacy, lobbying techniques and ASEAN as a forum for advocacy. Ellen Sana (DTP alumna) of the Centre of Migrant Advocacy (CMA) and former Chair of Migrant Forum in Asia was able to share valuable experience from advocacy for migrant workers in the Philippines and lead a role-play on interaction with the UN Special Rapporteur on the Human Rights of Migrants. There was very positive feedback from the participants who have now established a WhatsApp group to keep in touch between modules and to share information. The next module will be in September. The second module of the capacity building program was held in Jakarta from 6-9 September 2018. This module had a focus on experience sharing from Malaysia, one of the key destination countries for Indonesian workers, advocacy with the different ASEAN forums relevant to migrant workers, the Global Compact for Safe, Orderly and Regular Migration (GCM), and video advocacy and the importance that media can play in addressing migrant worker rights. There were also some notable outcomes from the module, including letters sent to the Foreign Minister and the Country Director of the IOM, and a short video about the GCM in Bahasa Indonesia. The feedback received was very positive, and participants committed to making further short videos on the specific GCM objectives. Module 3 was held in Jakartafrom 22-25 November 2018 with 26 participants. This module had a focus on building participants’ knowledge on the rights of women migrant workers and domestic workers – with a focus on the UN Convention on the Elimination of Discrimination Against Women (CEDAW) and ILO Convention 189 on domestic workers. There were sessions on business and human rights and updates on the GCM and GFMD processes. Sessions also focused on building campaign strategies and working collaboratively. Participants worked together to develop advocacy strategies to respond to the rise in unexplained deaths of Indonesian migrants in Malaysia. There was a practical exercise on lobbying and engagement with the government. Following practice sessions and preparations, participants in groups met with officials from the Ministry of Foreign Affairs, Ministry of Villages, and the Parliamentary Commission IX on Demography, Health, Manpower and Transmigration Affairs. Participants were able to raise their specific concerns and raised questions about the responsibility of the government for the protection and promotion of the rights of MWs in Indonesia and in countries of destination.